Peter Green painstakingly restored our dome and leaded windows, creating new to match where necessary and strengthening both skylight and windows . He is an amazing craftsman. very educational process for us over these many years. 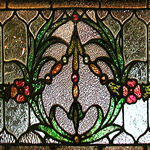 We have learned much working on stained glass windows made by artists such as the L.C. 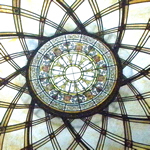 Tiffany Studios, Frank Lloyd Wright, John Lafarge & others. Our repair and renovation projects range from replacing just a few broken pieces in a residential entry to Church & Synogogue restorations taking months to complete . Seeing how yesterdays great glass artists solved design and installation issues are the benefits of our long involvement in repairing the work of others . One learns as much about the art of a given piece, as one does about the mechanics of how best to accomplish the repair. As such, all our repairs are undertaken with the utmost respect for the original artists work ; seeking to replicate as closely as possible his/her original materials and intentions. 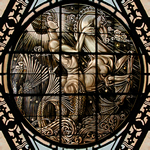 Whether a simple house repair or historic edifice, Renaissance artisans have the experience and sensitivity to return your damaged glass artwork to its’ original beauty and value. To schedule an evaluation on site, or to get further information about the nature of your repair or renovation project, call 203 226 9674, or email us at peter@renaissancestudios.com. 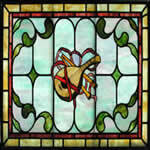 Renaissance Studio is a full-service stained glass studio serving Fairfield County and well beyond. 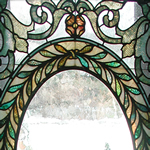 We provide our clients with over 40 years of expertise in glass design, fabrication and installation services related to artistry in stained and clear leaded glass windows. We have done projects in New York, New Jersey, and Connecticut: Darien, New Canaan, Stamford, Greenwich, Weston, Wilton, Westport, Bridgeport, New Haven, Ridgefield, Pound Ridge, Bedford, Mt. Kisco, Amawaug.